The newly-released Tax Cuts and Jobs Act (TCJA) is mostly a big income tax cut for businesses. While the new tax brackets for earned income will cut some families’ taxes, these are mostly financed with tax increases elsewhere in this part of the tax code. The vast majority of the net tax cut provided by TCJA comes overwhelmingly from steep cuts in business income tax rates. This means two things: First, the direct, short-run effects of the TCJA are steeply regressive, providing much larger tax cuts to the already rich than everybody else. On this point, there is no disagreement among analysts. Second, the only way for the TCJA to turn out to be a win for ordinary families is if Republican claims that its ripple effects will powerfully boost wage growth in the long-run turn out to be true. On this point, there is plenty of disagreement, but a review of the evidence strongly indicates that American wages are unlikely to be budged by the TCJA. The TCJA cuts the corporate income tax rate from 35 to 20 percent. Ownership of corporate equities is steeply concentrated among relatively few households — in 2013, the top 1 percent held 35 percent of all equities, while the top 10 percent owned nearly 80 percent. These are the households that will benefit directly from the cut in corporate rates. The TCJA also caps the top tax rate faced by business owners on “pass-through” income — income generated by non-corporate businesses that is passed through directly to owners, who currently pay taxes on said income through their individual returns. This is often marketed as a tax cut for “small businesses.” It’s not. Every small business is a pass through, but not every pass through is a small business. Some are hedge funds, private equity firms or white-shoe law firms. These latter types of businesses claim the lion’s share of total pass-through income. In fact, pass-through income is even more concentrated at the very top of the income distribution than corporate income; a recent Treasury Department report concluded that about 70 percent of this type of income is claimed by the top 1 percent. Republicans want us to discount the direct effect of these cuts and believe that they will unleash a cascade of economic changes that leads to more productivity-enhancing investment from firms and hence higher wages for workers. But they won’t. How do we know? 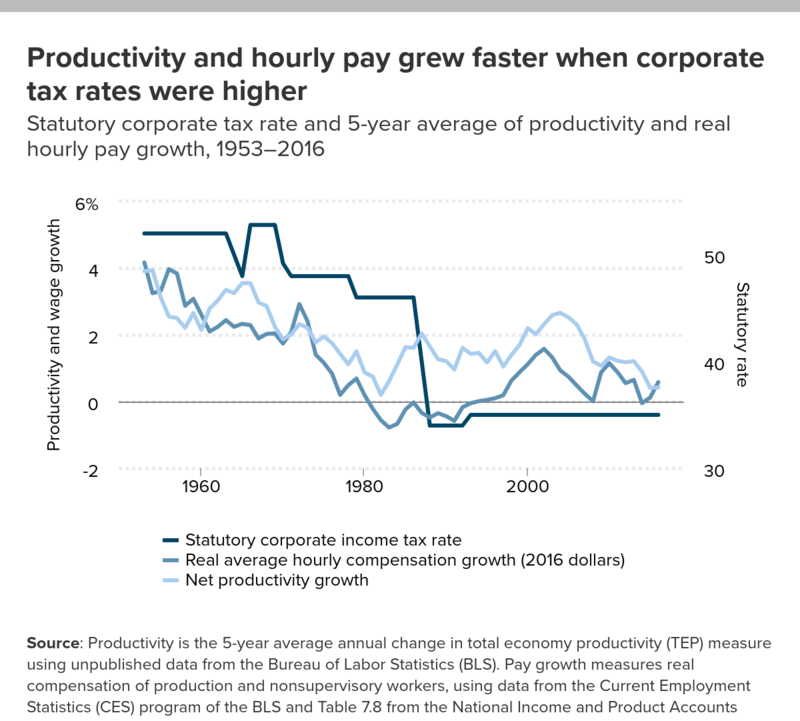 For one, productivity and wages both grew substantially faster in decades with higher corporate tax rates. Neither the 1986 tax reform that cut corporate rates deeply nor the 2003 cut in dividend taxes saw any upsurge in wage or productivity growth. Looking across advanced economies, cuts to corporate taxes between 2000 and 2016 were not associated with more-rapid investment (in fact, the very weak correlation that exists goes the other direction). Looking across U.S. states, reductions in corporate tax rates are not associated with faster median wage growth — but are associated with a higher share of total income claimed by the top 1 percent of families. Further, the lever through which business tax cuts are supposed to boost investment, productivity and wages is by boosting profits. But post-tax profit rates have been historically high in the recent recovery, even as investment and productivity have been historically weak. Something besides too-low profitability is holding back investment, productivity and wage growth (my explanation is a chronic shortfall of spending by businesses, households and governments, sometimes known as “secular stagnation”). Finally, the TCJA will increase the federal budget deficit. This isn’t actually much of an economic problem, as there’s no evidence that deficits are currently causing any damage to the U.S. economy. But the deficit will surely be invoked in political attacks on Medicare, Medicaid and other valuable programs that help the most vulnerable. We should be crystal clear on this point: The long-run fiscal position of the United States is fundamentally sound, threatened only by the “tax cuts first and always” zealotry of today’s Republicans. There are individual parts of the TCJA that aren’t awful. Increasing the standard deduction could by itself aid tax simplicity and benefit non-itemizers (a less-affluent group). While a dollar cap on the mortgage interest deduction isn’t our favorite policy, it is certainly true that tax expenditures like the mortgage interest deduction should be reformed to make them less costly and less regressive. But the net effect of the TCJA is overwhelmingly negative for most American families. The broad middle-class will receive trivially small direct benefits from it, and the promised knock-on effects from faster investment, productivity and wage growth will never actually trickle-down to them. Josh Bivens is the director of research at the Economic Policy Institute (EPI).